Holotype: AMNH 9453. Type Locality: "Zambi, Lower Congo", Zaïre. Country records from Congo, South Africa, Zaïre. Limits are: NORTH: Zaïre: Bavula (04°29'N, 19°07'E) — SOUTH: Zaïre: Zambi (05°51'S, 12°52'E) — WEST: Zaïre: Zambi (05°51'S, 12°52'E) — EAST: Zaïre: Zobia (02°59'N, 25°56'E). Three specimens from Zambi, lower Congo, June 1915, A.M.N.H. Nos. 9453-9455. Distribution.—While the species is only known from Zambi, it is assumed that its range embraces more or less of the lower Congo. 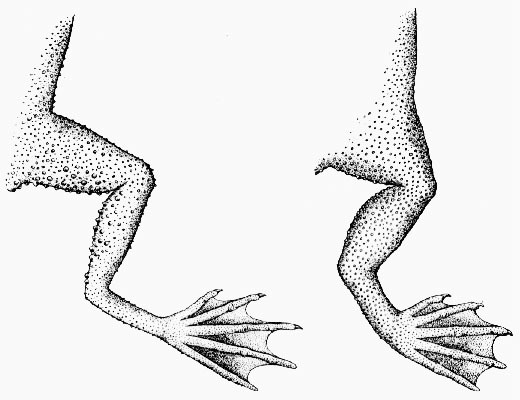 Diagnostic Characters.—Leg-length much shorter than in the other species of Hymenochirus; tibiotarsal articulation barely reaching the shoulder; tibia contained nearly three times in the body length. Fingers half webbed, toes completely webbed, the webs scarcely indented. Tubercles of the sides of the body not distinctly enlarged, only a little larger than those of the back. Type.—A.M.N.H. No. 9453, adult male, from Zambi, June 1915. Description of Type Specimen.—Head narrow, flat, without any indication of a canthus rostralis; snout subtruncate, the nostrils terminal; eye directed nearly dorsally, its greatest diameter contained one and a third times into the distance between its anterior end and the nostril; interorbital space a little less than three times the greatest diameter of the eye; no tympanum; no upper eyelid. Fingers about half webbed, the web scarcely indented; one (of inner digit), one, two and two phalanges of the respective fingers free; toes webbed to the base of each of the terminal phalanges, the web slightly more indented than that of the fingers. Tibiotarsal articulation nealy reaching the shoulder; the tibia contained in the head and body length a trifle less than three times; a prominent inner metatarsal tubercle, without horny sheath. Skin coarsely and uniformly tubercular, the tubercles of the sides of the body and hinder surfaces of the thighs a trifle larger than those of the back. Muddy brown above, indistinctly spotted with dark brown above, distinctly below. Snout to Vent 24 mm. Width of Head 5.5 mm. Hind leg (vent to tip of longest toe) 24 mm. Relations.—I am not at all convinced that the Cameroon-Gaboon specimens of H. boettgeri which Boulenger (1899, p.122) has considered indistinguishable from the type as described are really identical with it. There is considerable discrepancy in leg-length and rugosity between them and the original description. Still our specimens of H. curtipes differ so greatly from both the original description of H. boettgeri and the Cameroon specimens available to me that they cannot be confused with either. I have examined three Cameroon specimens referred by Boulenger to H. boettgeri, one (M.C.Z. 2468) thirty-three millimeters in length from the Ja River, another (M.C.Z. 2469) twenty-seven millimeters in length from Kribi, and the third (M.C.Z. 2462) twenty-five millimeters long, from north Cameroon. Whether or not these specimens are identical with H. boettgeri it is impossible to say without an examination of the type. They are, nevertheless, conspicuously different from H. curtipes in their much greater leg-length, enlarged lateral tubercles, broad heads and indented webbing of the digits. The tibia of these specimens is contained into their head and body length from two and one-fifth to two and one-third times. Their tibiotarsal articulation just reaches or nearly reaches the eye. Tornier (1896, p. 163) states in his original description of H. boettgeri that it is the tarso-metatarsal joint which just reaches the eye. 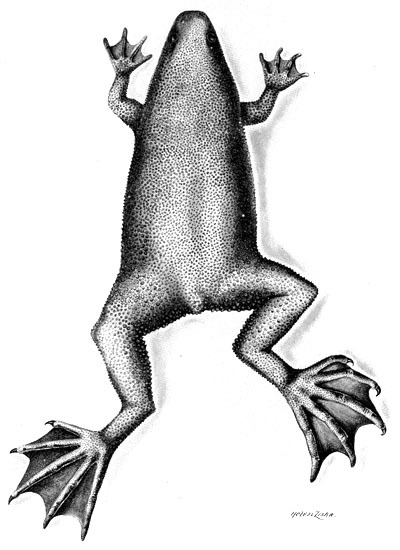 In ours specimens of H. curtipes the tarso-metatarsal articulation extends at most only a little beyond the shoulder. It is apparent that, regardless of the status of the Cameroon specimens, H. curtipes is very different from H. boettgeri. Hymenochirus boettgeri, (Tornier) and Hymenochirus curtipes, new species. Comparison of the right hind limbs, dorsal aspect. Boulenger (1906, p. 158) states that H. feae is very similar to H. boettgeri, "agreeing with it in every respect except that the fingers and toes are fully webbed to the tips." But, to judge from Boulenger's figure (idem, Pl. I, fig. 1), it would seem that H. feae is also different from H. boettgeri and like H. curtipes in lacking the greatly enlarged tubercles of the sides of the body which, although not shown in Tornier's figure of H. boettgeri, are very distinct in the Cameroon specimens that I have examined. Variation.—The three specimens of H. curtipes in our series measure 28, 26, and 24 mm. from snout to vent. There is no variation in color, and practically none in proportions. Noble, Gladwyn Kingsley (1924): Contributions to the herpetology of the Belgian Congo based on the collection of the American Museum Congo expedition, 1909-1915. Part III. Amphibia. - Bulletin of the American Museum of Natural History, 49: 147-347, Plates XXIII-XLII.